Fearless Prediction: While NDSU’s run at consecutive national titles and 27-consective playoff wins ended after losing in the playoff semi-finals last year against James Madison, the Bison still have won or at least shared the last six MVFC titles. There is little reason to believe NDSU’s run within the conference will end this year and using the motivation and 16 starters back will aid in NDSU’s incentive. 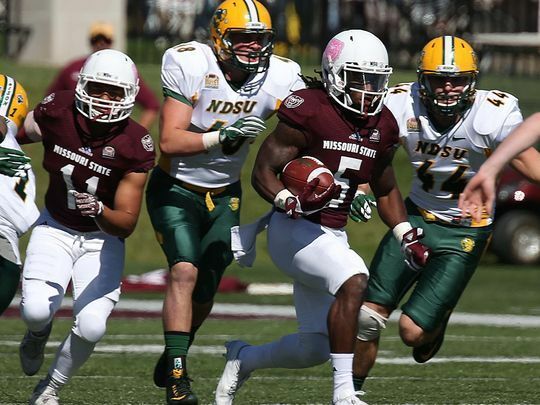 NDSU’s defense should again be the top reason NDSU remains not only in MVFC contention with nine starters back on a team that finished as the top league scoring group last year. Impact player: LB Nick DeLuca is back for a fifth season after his seemingly senior year last year ended early due to a shoulder injury. He was the 2015 MVFC Defensive Player of Year and during the offseason has seemed to get back to his high standard. 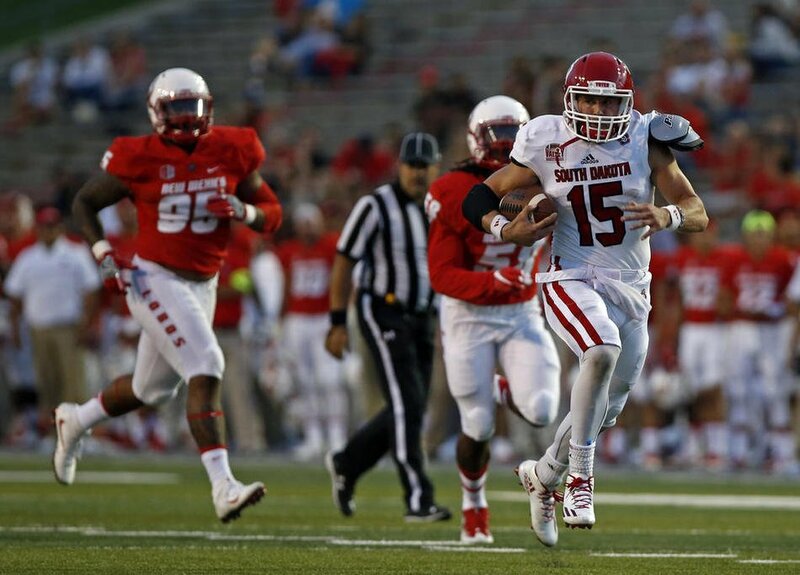 Last year, he still played in three games including 15 tackles plus a 40-yard interception return touchdown in an overtime victory against Eastern Washington. He also recorded eight tackles in the win over the 11th-ranked FBS Iowa before hanging up for the season. 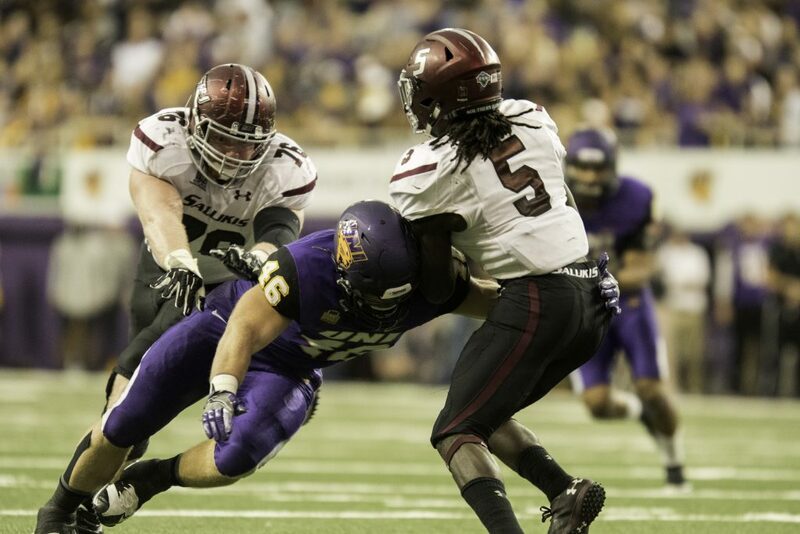 He is the only FCS player nominated last year and one of three FCS players this year for the Butkus Award, presented annually to the top linebacker in all of college football. Fearless Prediction: The Jackrabbits actually won the MVFC automatic bid last year when SDSU tied NDSU for the title but won the bid by beating the Bison in Fargo for the first time since 1962. However, SDSU could not win the rematch in the playoffs and finished its third season this decade with a playoff loss to NDSU. But this year, much of the team is back including the three headed offensive monster in quarterback Taryn Christion, wide receiver Jake Wieneke, and tight end Dallas Goedert. Scoring should not be a problem for the Jackrabbits but how well the team does come playoff time will be how well the defense does. 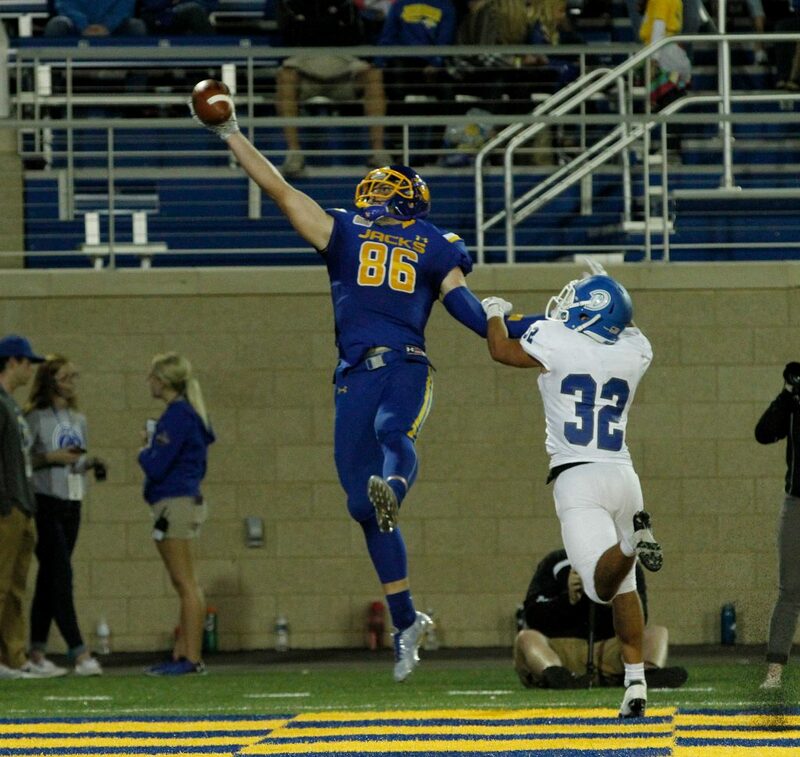 Impact player: TE Dallas Goedert was the one I selected here but it very well could have went to reigning MVFC Offensive Player of the Year in now junior Christion or multiple year All-American now-senior Weineke. Goedert, who is also coming into his senior seasoin, is the match-up problem for opposing defense with his 6’4” 260 lb size. He showed that off last year in setting a new Jackrabbit single-season record by hauling in 92 receptions and ranking second on the squad with 1,293 receiving yards and 11 touchdown receptions. Goedert demonstrated big-play ability as 21 of his catches covered at least 20 yards, including four touchdown receptions of 39 or more yards. Fearless Prediction: While NDSU and SDSU shared the MVFC crown last year, it was the Penguins that went the farthest in the postseason. YSU made it to the national title game in Coach Bo Pelini’s second season in his home town. YSU lost to James Madison in the championship game. The Penguins must find a new running back as the top two backs (Jody Webb and Martin Ruiz) and two defensive ends that were drafted in the NFL draft this past spring in Derek Rivers and Avery Moss but do return much of the national runners-up team and should again be in line for a playoff spot. 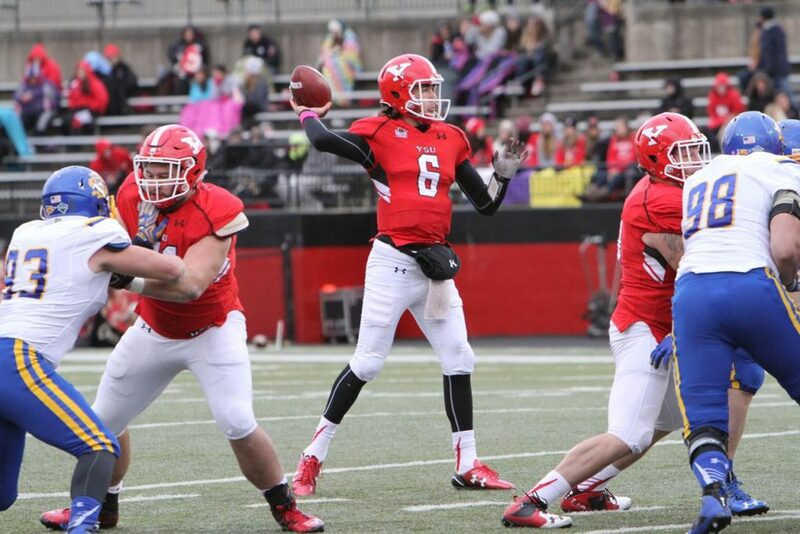 Impact player: QB Hunter Wells was a huge factor for the Penguins last year to get to the national championship game. He went 7-2 as a starter after being the back-up to begin the season. The now-senior threw for 1,120 yards and eight touchdowns with just two interceptions in the playoffs. 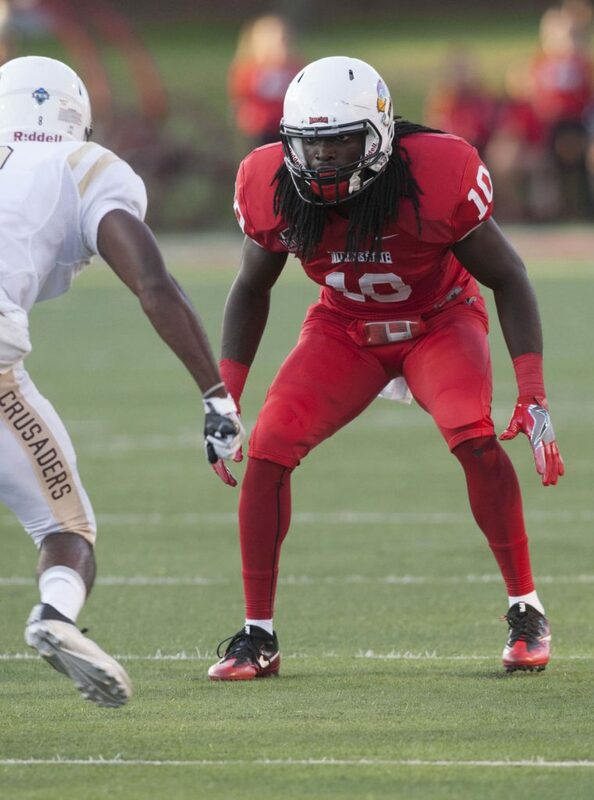 He averaged 224 yards in the postseason to lead YSU to its first National Championship Game appearance since 1999. Fearless Prediction: The Redbirds were one of the last playoff teams in last year after finishing the regular season just 6-5 overall but that was good enough for the program’s third straight postseason appearance. ILS lost to Central Arkansas in the opening round. The Redbirds won its last three regular season games and also defeated FBS Northwestern early in the season to aid getting the postseason bid. This year, the Redbirds have 14 starters back for Coach Brock Spack’s squad. Impact player: CB Davontae Harris ranked first in the MVFC in passes defended with 15 (13 PBU, 2 INT), while averaging 1.36 passes defended per game to also top the list. The now-senior also tallied 5.5 tackles-for-loss and finished last season with 59 total tackles. Fearless Prediction: UNI finished 2016 just 5-6 despite a big win over the Big 12’s Iowa State to begin the season. This has been a trend for Coach Mark Farley’s team—start slow and then fight to try to get a playoff spot. The Panthers fell just short last year but very well could be in contention this year despite the loss of 11 starters from a season ago. Impact player: LB Jared Farley is back for his senior season this year. He has started 24 games in his Panther career under his father. He led the team in tackles with 80, ranking in the top-15 in the MVFC. He recorded eight tackles and a key interception in that win over Iowa State to begin last year. 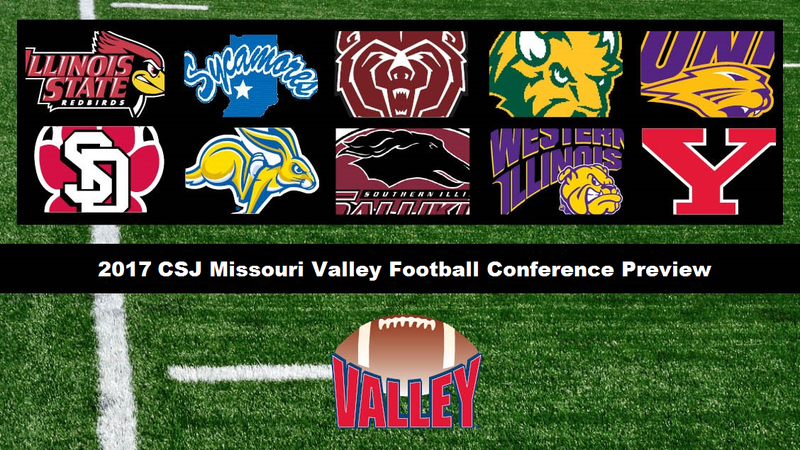 Fearless Prediction: The Leathernecks looked almost assured of a playoff spot last year with three games to go but a three game losing streak to end the season finsished the WIU season with just a 6-5 overall record. Nine starters are back on each side of the ball this fall for second year head coach Charlie Fisher. The defense led by Brett Taylor, who led all of FCS in tackles should be strong and the offense will again be headed by Sean McGuire despite the loss of NFL hopeful Lance Lenoir. 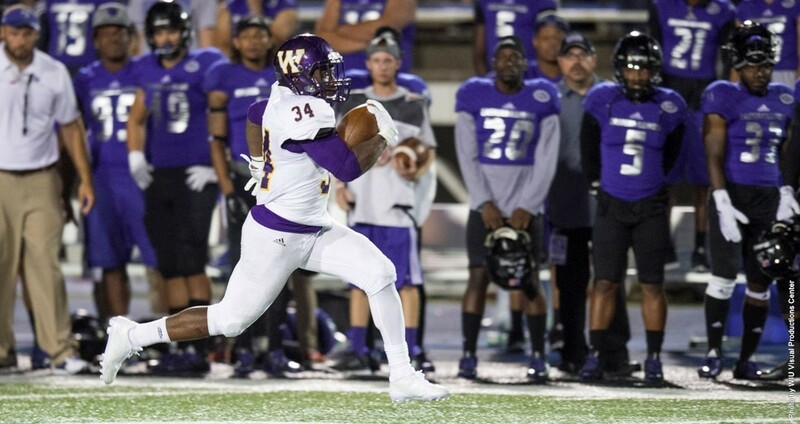 Impact player: RB Steve McShane is my pick to be the impact player for WIU despite those two already mentioned. The now-junior was second in the MVFC with 917 rushing yards (83.4 ypg) and had a team-leading eight rushing touchdowns. He also added 234 receiving yards on 23 catches and a touchdown. Fearless Prediction: In Coach Bob Nielson’s first year, he guided the Coyotes to a 4-7 overall mark. USD, however, lost its last four games just before winning the three prior games in a row. The Coyotes hope for more consistency this year. Impact player: QB Chris Streveler led the team both in passing and rushing yardage last year. The now-senior accounted for 31 of USD’s 41 touchdowns during the season and finished fourth in the nation in points responsible for per game (18.6). He finished as the Valley’s fourth-leading rusher and sixth-leading passer in terms of yards per game. He threw for 1,947 yards and 22 touchdowns against nine interceptions and also ran for 823 yards and nine scores. The former FBS Minnesota transfer hopes to gain on that season to be even better this year. 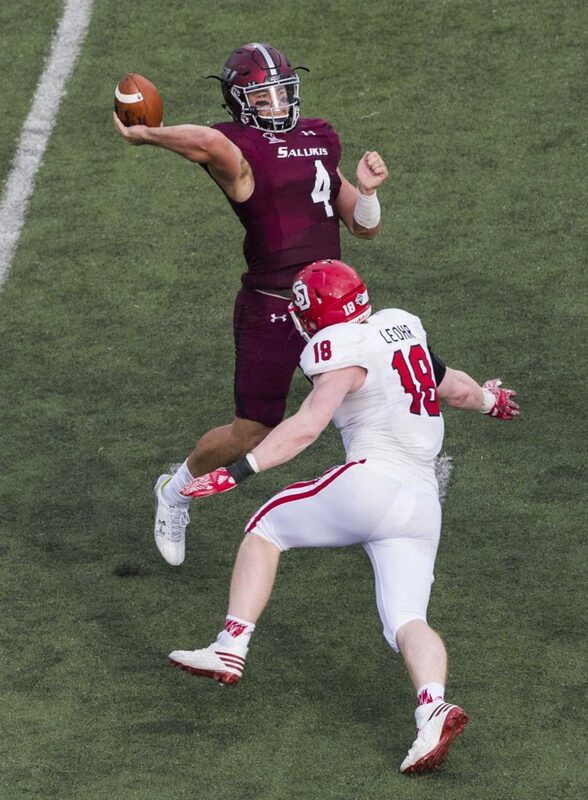 Fearless Prediction: The Salukis finished 4-7 last year but went 2-1 in the final three games when Sam Straub was inserted as the starting quarterback. SIU returns 13 starters overall and hope to continue the offensive performance (30.9 points per game) but need to improve the defense which gave up 30.7 points per game. Impact player: QB Sam Straub should put up some gaudy numbers in Coach Nick Hill’s offensive scheme this year. He showed flashes in his three starts last year in averaging 385.0 yards per game passing. Fearless Prediction: The Bears showed promise last year in Coach Dave Steckel’s second season—going from 1-10 to 4-7. This year, 18 starters are back in Springfield in the hopes to continue that improvement. Impact player: WR/RS Deion Holliman ranked seventh in the FCS in combined kick return yardage (950) last fall and second in the MVFC in kickoff returns (23.5) and third in all-purpose yardage (119.6 ypg.) after topping the 100-yard mark for kickoff returns in four different contests. Holliman brought the season’s opening kick back 91 yards for a touchdown and returned a punt 57 yards for a score vs. Southern Illinois, making him the only FCS returner to record both a kickoff and punt return for a touchdown in each of the last two seasons. Fearless Prediction: The Sycamores are the only MVFC with a new coach this year with Curt Mallory taking over the reins in Terre Haute after being an assistant at Wyoming. INS finished 2016 at 4-7 in Mike Sanford’s final season and he resigned after last season ended. Sanford citing a “special opportunity” following the appointment of his son, Mike Sanford Jr., as head coach of Western Kentucky and is now an assistant under his son at WKU. This year’s team has just 11 starters returning from last season. Impact player: QB Isaac Harker will be under center again this year in his junior season. 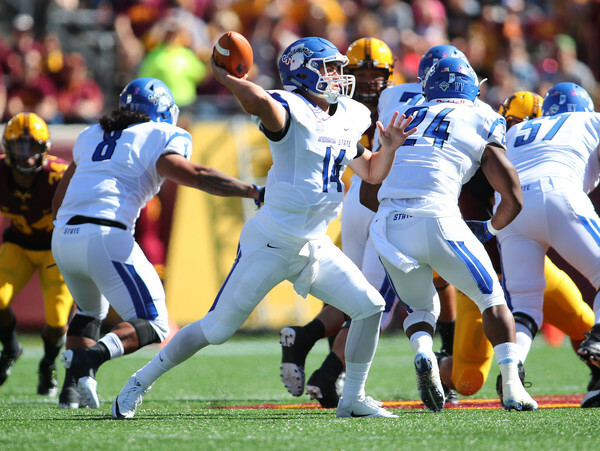 He finished fourth in the MVFC in passing (255.9 YPG), fifth in total offense (240.5 YPG)…He ended the season throwing for 2,559 yards, 19 touchdowns and 8 interceptions. QB- Taryn Christion, SDSU 6-2 220 Jr.
RB- Lance Dunn, NDSU 5-9 207 Jr.
Steve McShane, WIU 5-8 185 Jr.
Brady Mengarelli, SDSU 5-10 195 Sr.
FB- Kane Louscher, SDSU 6-2 245 Sr.
WR- Malik Earl, MSU 6-3 217 Sr.
Spencer Schnell, ILS 5-9 185 Jr.
Jake Wieneke, SDSU 6-4 215 Sr.
TE- Dallas Goedert, SDSU 6-5 260 Sr.
OL- Jacob Judd, WIU 6-3 300 Sr.
Charlie Harmon, SDSU 6-6 300 Sr.
Vitas Hrynkiewicz, YSU 6-4 300 Jr.
Jacob Ohnesorge, SDSU 6-3 295 Sr.
Austin Olsen, SIU 6-5 320 Sr.
Justin Spencer, YSU 6-5 305 Sr.
LS- James Fisher, NDSU 6-2 222 Sr.
PK- Jerry Nunez, INS 5-11 185 So. 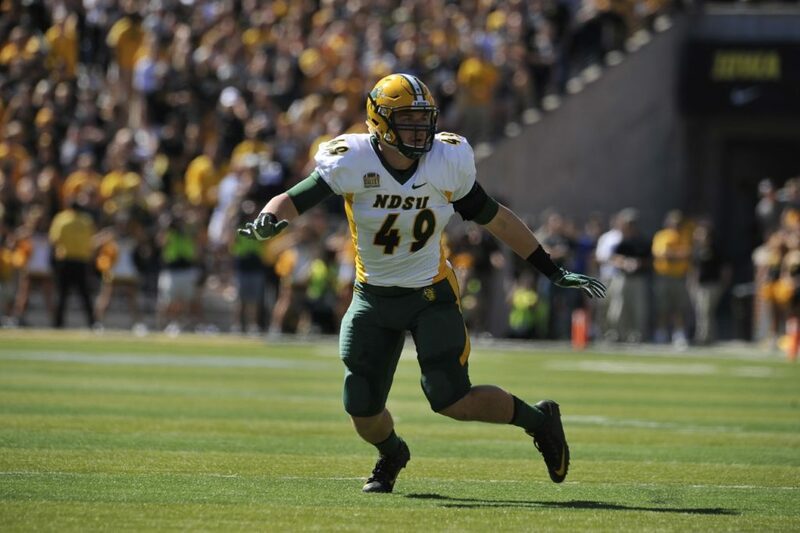 DL- Colby Isbell, MSU 6-3 239 Sr.
Dalton Keene, ILS 6-4 280 Sr.
Greg Menard, NDSU (injured) 6-2 238 Sr.
Kellen Soulek, SDSU 6-5 315 Sr.
Nate Tanguay, NDSU 6-4 293 Sr.
LB- Armand Dellovade, YSU 6-0 210 Jr.
Nick DeLuca, NDSU 6-3 248 Sr.
Jared Farley, UNI 5-11 221 Sr.
Christian Rozeboom, SDSU 6-2 225 So. Brett Taylor, WIU 6-2 230 Sr.
DB- Tre Dempsey, NDSU 5-10 184 Sr.
Robbie Grimsley, NDSU 6-0 195 Jr.
Davontae Harris, ILS 6-0 205 Sr.
Alec Kocour, ILS 6-0 200 Sr.
Malcolm Washington, UNI 6-2 172 Sr.
P- Mark Schuler, YSU 6-5 250 So. RS- Deion Holliman, MSU 5-9 190 Sr.